Found some things that for most of the members probably don't even get a mention in their diary, but for me, currently taking pride of joy on my finds shelf. (Well, they would of, but the chuffing big horseshoe was so heavy it has pulled the shelf off the wall!). Thanks for organising and allowing me to join in in novice corner. Looking forward to the next adventure, but can we just have the temperature down by 1 or 2 degrees if possible. After all, this is Scotland! Well done Elly always nice to find silver. I found a silver 3d 1939 in good nick but apart from a sunburnt neck the rest was the usual rubbish. Beat the Doc - Identify your finds here / Re: Small lead seal? From looking at bagseals.com, it should be a lead seal from a bag of flour. Flour used to be categorised into '00', '0', '1' and '2' grades, '00' being the finest and whitest and working down to the almost wholemeal grade '2' flour. 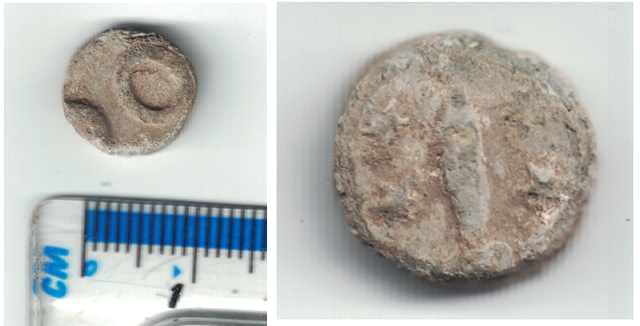 Beat the Doc - Identify your finds here / Small lead seal? I found this yesterday, but have no idea what it could be. 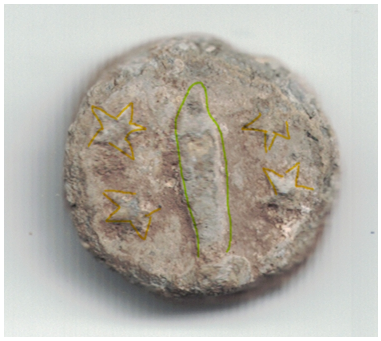 It's quite thick (3mm) and appears to have four stars encircling an object on one side. I've attempted to trace the stars below in yellow. The other side has a large relief 'O' and what looks like the beginning of another 'O' at the edge. On my Deus it gives a solid VDI of 60. Great wee find! ell done - silver is always good!